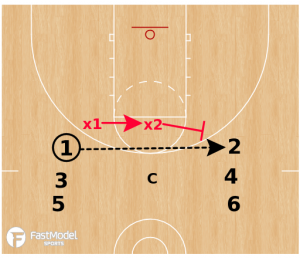 This 4 on 3 Scramble Defensive Drill was posted to the FastModel Sports Basketball Plays and Drills Library by Matt Wheeler. Matt Wheeler has spent the last 10 years coaching in the Orlando, FL area. For the last 6 seasons he was at Olympia High School where he spent time as assistant boys varsity coach, head girls varsity coach, and head boys varsity coach. This competitive defensive drill focuses on closeouts, sprinting to help, and stunting at the ball. To add a communication component to it, require the defenders to say “I Got Ball” on the closeouts and “Help” when they are in help. The defense must defend and communicate four passes perfectly then they can play live 2v2. 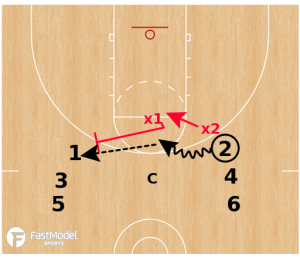 On the first two passes, the defenders sprint to help/closeout. 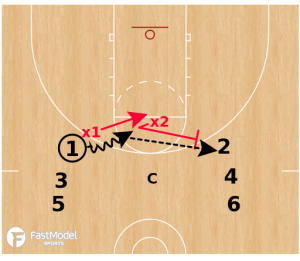 On the third and fourth pass the defenders stunt at the ball as it is driven at them, then sprint to closeout/help. 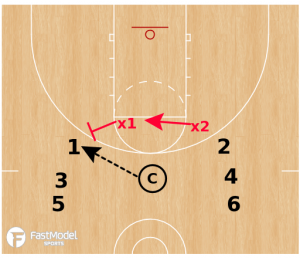 Use defense scoring in this drill. If the defense gets a stop they get a point and they stay on defense against the next team. If the defense doesn’t communicate, sprint to help, close out correctly or they get scored on, they immediately lose and go to the end of the line and the offensive team goes to defense. x1 closes out on 1.
x2 closes out on 2.
x1 stunts at the ball. x1 closes out on the ball as x1 sprints to help. x2 stunts at the ball. x2 closes out on the ball as x1 sprints to help. Play is now live 2 on 2.